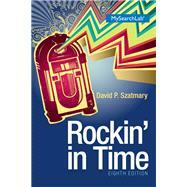 Brief, authoritative, and current, Dave Szatmary's Rockin' in Time: A Social History of Rock-and-Roll, 8/e, weaves the major icons of rock-and-roll into a larger social/historical fabric. Rather than an exhaustive catalog of artists in rock history or a guide to learning musical notation, the book places rock-and-roll in the context of the social issues that surrounded and shaped it. Topics include the influence on rock music of such trends as the civil rights movement, political and economic shifts, demographical change and the baby boom, the development of the music business, and technology advances. Dave Szatmary worked in the music industry and taught the history of rock and roll at several universities after earning his Ph.D. in American History at Rutgers University. He has contributed to the All Music Guides to Rock, Jazz and Blues and wrote A Time to Rock (Schirmer’s) He also authored Shays’ Rebellion (University of Massachusetts Press, 1980), which has been made into a film and served as the basis for a History Channel program. Szatmary regularly reviews rock and jazz books. He currently serves as the Vice Provost of Educational Outreach at the University of Washington, one of the premier professional and continuing education programs in the country that serves 50,000 students annually. He is a noted expert and has been interviewed extensively by the media about online learning and higher education budgeting in addition to rock and roll.